It’s What’s On the Outside That Counts. Typically, the primary draws of Tindall’s total precast construction are the swiftness of installation, the ability to achieve precise design requirements, and the strength and durability of the materials. 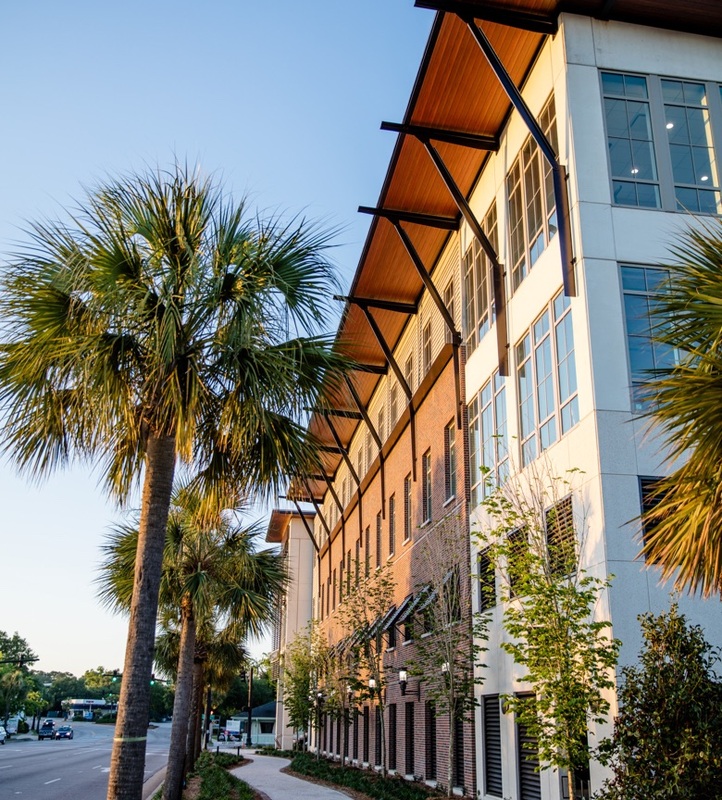 While all of these elements held true for the Shem Creek Office and Parking Structure, one advantage outshone all the others — the ability to create, and seamlessly blend, a huge variety of aesthetic elements into one striking, total precast creation. Total precast structures, such as the four-story, 121,400-square-foot Shem Creek Office and Parking Structure, are unusual for this area. However, since a parking structure was needed beneath the office building, and due to its inherent ability to withstand the coastal environment, precast just made sense. After the project began, it became clear that precast was the ideal method to choose, since it was versatile enough to tackle all the aesthetic demands of this build. Given the area of this construction, blending with the surrounding setting was crucial. The Shem Creek structure needed to seamlessly meld with its surroundings, while simultaneously presenting a modern flair that elevated the aesthetic appeal of the area. To achieve this, Tindall utilized wood grain form liner, brick inlay, and colored concrete with sandblasting — meeting all of the visual criteria with just precast concrete. Sandblasting was used to expose the aggregate, giving it a tabby-like appearance, and deep shadow lines were used to exactly mimic wooden shiplap. The blend of these modern and rustic aesthetic touches resulted in a visually stunning construction that is a testament to Tindall’s ability to provide creative solutions to unique challenges.